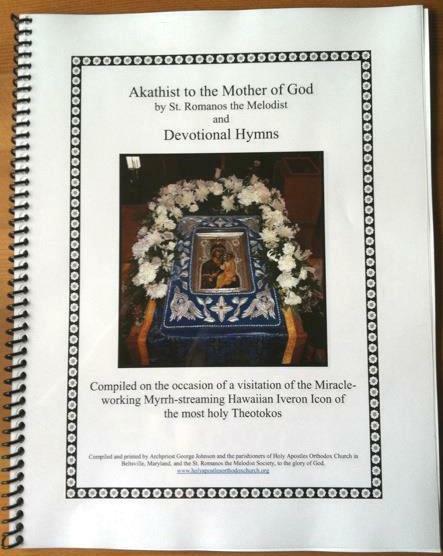 This devotional book to the Mother of God is 63 pages long, and includes the Akathist by St. Romanos the Melodist, arranged with pointed text so that it can be sung congregationally, along with musical settings (also available on the Occasional Services page) of O Heavenly King, Troparion to the Iveron Icon, Refrains to the Mother of God, To Thee, the Champion Leader (two settings), It is Truly Meet (three settings), O My most Blessed Queen (the prayer sung at the end of the akathist), O Theotokos and Virgin (four settings), Ode 9 Irmos for the Nativity of the Theotokos, the Magnification for the Theotokos; Rejoice Thou O Queen, Thou art the True Vine (Georgian melody), Beneath thy Mercy, and In Thee Rejoiceth. For multiple copies or more information, email apostlebird@aol.com. This spiral-bound book published in 2003 contains most of the music from the Vespers page of this website. This spiral-bound book published in 2004 contains material from the Occasional Services page.